Garlic is known as a sulfur residue food that cleanses tissues and aids in oxygenation. It is composed of nitrogenous substances, sodium, potassium, selenium, calcium, magnesium, silicon, sulfuric, phosphoric acid, vitamin C, D, B, phytosterols, extractives, and essential oils. Garlic is a natural antimicrobial by nature and therefore a known immune booster. The antibiotic and bactericidal properties of garlic come from its content of the amino acid, allium. This amino acid is believed to promote and enhance cardiovascular health and have a soothing effect on the respiratory system of the body. It is a well know home remedy for cough, common cold and sore throat. Garlic activates liver enzymes. Research also indicates that garlic diminishes a process that creates cancer-causing compounds in your body. A study published in Nutrition and Cancer in 2010, for example, found that allicin, derived from fresh garlic cloves, could kill colon cancer cells. 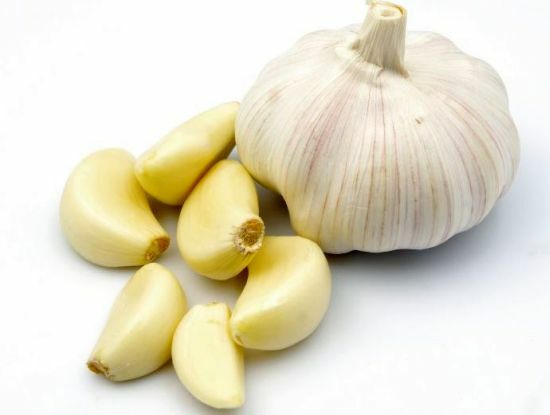 Moreover, a review published in Leukemia Research found that garlic-derived allicin can treat breast, bladder, colorectal, hepatic, prostate cancer, lymphoma and skin tumor cell lines. Research from the Medical University of South Carolina found that organosulfur compounds found in garlic may play a part in killing brain cancer cells. A 1999 study by S. Ankri and D. Mirelman shows that a compound within garlic called allicin is responsible for garlic’s antimicrobial, antiviral, and antiparasitic activity. It’s also been shown to combat drug-resistant strains of E. coli and could potentially battle some superbugs that are resistant to antibiotics. Washington State University showed that garlic is 100 times more effective than antibiotics at fighting disease causing bacteria commonly responsible for foodborne illness. Its anti-viral potency is perhaps even more effective. Allicin isn’t actually in garlic. A compound, alliin, and an enzyme, alliinase are part of the cells in a garlic clove. These two are kept separate, however, when those cell walls are ruptured, they meet and form the all-powerful and mighty allicin. Turns out heat neutralizes the health-giving benefits of allicin. A 2001 study by K. Song and J.A. Milner showed that heating, microwaving, or boiling crushed garlic destroyed all the alliinase enzyme activity within it. This entry was posted on April 1, 2015 by thrivecoach12 in Herbs & Spices, Nutrient Values and tagged Cancer, fighting disease, garlic, home remedy for cold, home remedy for cough, home remedy for sore throat, immune booster, tissue cleanser.